How is it that people associate Christians with holier-than-thou attitudes and an insistence on purity? How is it that judgment is the face the world too often sees? We are built around “the same stone which the builders rejected” — Jesus, a convicted criminal executed by the Romans. The foundation supported by that cornerstone, the Church, was built out of his followers, who rejected him, denied him, grasped for power, and persecuted each other. They generally got it wrong throughout Jesus’ life, and only the Spirit of God could get them going in the right direction. We still get it wrong more often than not. If we are a holy temple, acceptable to God, we are built out of broken bricks and rocky rubble, not smooth and shining stones. Why should people think they have to be holy in order to come in to the Church? We ourselves weren’t holy; we’ve been made holy by having our pitted pebbles grafted into others’ cracked concrete. Unity in the Spirit is what makes the temple beautiful, not the uniformity of the building material. 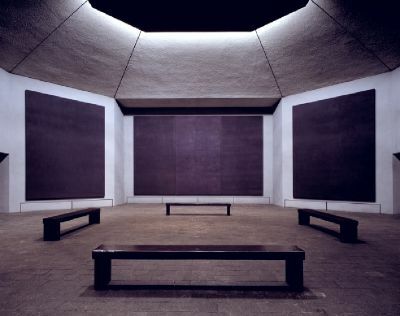 This entry was posted in 30 Mins 30 Days, Daily Office and tagged cornerstone, Morning Prayer, Psalm 118, Romans, Rothko on June 30, 2013 by Rodger Patience.